BMW and Mercedes-Benz are considering joining hands for developing automobile technologies. According to a media report, the German car makers could jointly develop vehicle platforms, electric car batteries and autonomous vehicle technologies. Both - Mercedes-Benz’s parent Daimler and BMW had revised their 2018 profit targets downward due to trade tensions and incurring additional expenses to develop electric vehicles (EV). Further, it has been reported that automotive sales have fallen for the first time since 2010. While Daimler will be adding 10 EVs over the next 4 years, BMW will offer 12 battery-only EVs by 2025. Recently, BMW and Toyota have been working together on the Z4-Supra project, while Volkswagen has reportedly been negotiating with Ford on production of commercial vehicles and later on self-driven vehicles. BMW is also working with Intel on autonomous vehicle technology. Daimler has engine agreements with Renault and Nissan. The two companies have been rivals ever since a failed takeover of BMW by Daimler in 1959. Last edited by blackwasp : 21st December 2018 at 14:25. Step in the right direction. Given the giant step that ICE car makers need to take to enter profitably into tomorrow's world of EVs etc a significant investment in R&D is ongoing and more will be needed - environmentally friendly batteries for example or solar panels with enough density to practically power a car. I think we may see more such collaborations to help car companies stay competitive and relevant. for many years, I have heard non-car enthusiasts refer to the luxury limos as a Mercedes 7 series or a BMW E-class And now maybe they won't be incorrect in the future haha! I agree that it makes business sense - this is fast turning into an age of collaboration. However, Could this lead to even blander cars in the future? In an age when BMW is focusing on comfort, and Mercedes considers adding sporty aspects to almost everything, are we leading up to an awkward mishmash? Gosh, this would have been unimaginable a decade ago. But such are the times. 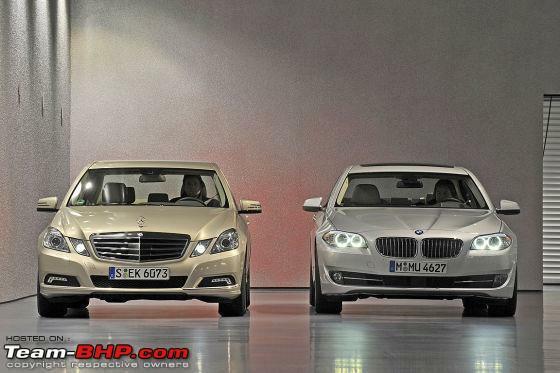 BMW needs Mercedes more as it is the smaller one. In fact, BMW & Honda have long been seen as vulnerable by experts due to their independence & smaller size. I expect to see more such collaborations as the automotive world is going to change more in the next 10 years than it has in the last 50. Heck, would anyone have expected VW to collaborate with Ford? Not really. Sporty or luxurious all depends on the late-stage final tuning. The same platform in a Superb is luxurious, while in an Octavia vRS is sporty. Since it's the luxury segment, they have to differentiate themselves to stay in the game. And I'm pretty sure that's where they'll invest their savings from this collaboration. I guess BMW and Mercedes have woken up and realized that competition with fellow manufacturers is not a cause for concern but regulators are. The most tantalizing possibility, although perhaps least likely, is that the automakers may collaborate on a common platform for the BMW 1 Series and Mercedes A-Class. The models on the shared underpinnings wouldn't arrive until after 2025 at the earliest because new generations of both models are still very recent arrivals. What has the world come to! While I see and appreciate the merits of collaboration, I fear this could affect competitiveness which is not good for the consumer. For example, imagine if Daimler did buy BMW in 1959. I highly doubt the S-class or 7 series today would be this good. Would we have a maybach62 and RR phantom? Both these companies have raised the bar because they are arch rivals. Completely agree, but the fact is some manufacturers have that extra grip in some areas that rivals have no option to adopt to that or fall behind. This is already happening in other areas. Look at the Smartphone scene - Apple and Samsung are fierce rivals, but the former get its OLED screen from Samsung; still they are entirely different and have their identity. Similarly, iPhone and Google Pixel 3 are flagships from Apple and Google, but both are indeed manufactured by Taiwanese Foxconn. If the manufacturers can differentiate and align to the core values, customer probably won’t be impacted that much. I agree, but the sad truth is that the ultimate owners stick together and collaborate when the need arises. The competitiveness, to an extent is a perception of the buyers.. in real world there isn't that level of one-upmanship that we perceive. For example the big 3 jointly own a mapping service which they acquired from Nokia. Also if we go back a little further into time, Herbert Quandt who was known for resurrecting BMW in the 50's with an approximate 50% ownership, also owned 10% of Daimler. He also owned a massive list of ancillary units for automobiles dealing in body panels and batteries, Varta is a battery brand in which he had large stakes in. Their stake in Daimler was sold to a Middle-Eastern family if I remember. It all goes back, whether it was Audi which started out making the chassis for Daimler-Benz or the subsequent full control Daimler-Benz had over Auto Union (an earlier form of Audi) which in turn was purchased to the tune of 50% by VWAG. The Third Reich is where almost all collaborations happened and even today I'm sure all the owners and partners dine together in business conferences with Merkel. Germany and Japan do not hesitate to collaborate.. almost all Japanese brands today have married each other with the front of "combined R&D". In my eyes the automobile conglomerate is more conglomerated than the normal man would have you believe. All times are GMT +5.5. The time now is 04:20.